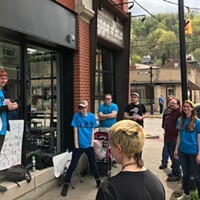 Just two weeks before the G-20 summit, the anarchists and anti-authoritarians in the Pittsburgh G-20 Resistance Project, long meeting in private to plan protests, are about to open a public meeting space on a busy corner in Greenfield. They say their door-to-door campaign and fresh newsletter are gaining them sympathizers. Located on the first floor of 4374 Murray Ave., the Resistance's "convergence center" is a windowless storefront with multiple rooms used so far for meetings and a library. "There will be a lot of organizing going on" in those rooms, says Resistance rep Jesse Ericson. "It will have regular hours and will be a space for the community to stop by and ask questions." Members have also been visiting local residents one-on-one to distribute a new four-page tabloid (online soon at resistg20.org) that explains the group's opposition to G-20 policies, Ericson says. This includes the summit's likely main topic: economics. "What they're calling 'free trade' to us means less jobs, lower wages and less job security," he adds. "We think it's very important for people to get a face attached to the protesters," Ericson adds. "We're members of the same communities as every other Pittsburgher." The group has called for a march on the summit site, the David. L. Lawrence Convention Center, on Sept. 24. The group has also issued a "call to action," offering a "menu" of places, mostly Downtown and in the East End, where everything from "an hour-long picket" to "a 30-second street-theater piece" may occur on the morning of Sept. 25. Proposed targets include: coffee chains that have repressed union activity; "check-cashing joints which charge outrageous interest rates and feed off of poverty"; and banks that charge high fees. The list also includes places previously picketed by local anarchists, such as military recruiting centers and Carnegie Mellon's robotics facilities, which receive large defense contracts. Across town in Garfield and East Liberty, the progressive groups associated with the Thomas Merton Center have been organizing in the open for months. But they've only lately gained positive attention for their struggles to get protest permits -- and for their call to keep Downtown open during the summit, and free of mass deployments of law enforcement and the military. For the Merton Center groups, whose protest encampments and marches Downtown were announced weeks ago, the questions of when city permits will be issued, and for where, remain unanswered less than three weeks before the summit arrives. Lawyers representing these local groups have told the city they will file their lawsuit if permits were not issued by Labor Day -- after City Paper went to press. But group members are still debating how far they will go without permits, or how they will act if police try to keep them from reaching the Convention Center -- or as close as their eventual permits allow. The groups should march without a permit, suggested Carl Davidson, of Beaver County Progressive Democrats of America, at a Merton-sponsored Sept. 1 assembly: "Ten thousand people is a permit." "I think most of us are not willing to set up tents and do civil disobedience if they say no" to permits, countered organizer Edith Bell. 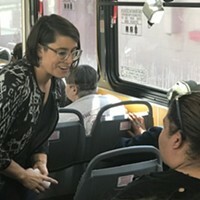 The groups had set Sept. 8 as an informal deadline to return to their weekly planning meeting with decisions about how far to push the permit fight as well as their actions in the streets. Naomi Archer, an organizer who had similar struggles with Miami-Dade authorities prior to a 2003 trade summit there, assured the crowd she had just driven up to join. "This is a real important moment," she said -- whether or not their protests are permitted, or meet with a disproportionate or indiscriminate police response. 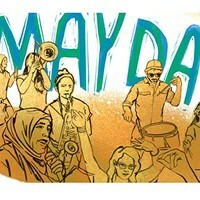 "If, God forbid, anything happens during the days of protest, you've done your work to get accountability afterwards."